1711: he performed in Kyôto as a katakiyaku; his first stage name was Ôyama Tamiemon. Fall 1712: he settled in Ôsaka and became a disciple of Yamamura Kazaemon. 12th lunar month of 1712: he became tachiyaku, took the name of Yamamura Giemon I and performed in the kaomise drama "Enmei Kobukuro". 11th lunar month of 1713: Giemon became jitsuaku and played in Ôsaka the role of Enkai in the kaomise drama "Yoyo Meoto Tsuru no Mago", which was produced by Arashi Sanjûrô I at Shioya Kuroemon's theater. 1st lunar month (spring?) of 1715: first Kabuki adaptation of Chikamatsu Monzaemon's drama "Daikyôji Mukashi Goyomi", which was entitled "Daikyôji" and was staged in Ôsaka; Giemon played the role of Ishun [casting]. 11th lunar month of 1715: Giemon played the role of Irimatsu Shigezô in the kaomise drama "Ugashin Kogane no Hokora", which was produced by Sawamura Chôjûrô I and celebrated the shûmei of Takeshima Kôzaemon II. 11th lunar month of 1718: Giemon played in Ôsaka at the Kita no Shinchi Shibai the role of Yoneemon in the kaomise drama "In'yô Inui no Machi-zukuri". Fall 1720: Giemon went back to Kyôto. 11th lunar month of 1720: he changed his first name to Gizaemon (the first ideogram was changed) and performed in Kyôto the kaomise drama "Shin Yakata Fukutoku no Kado" which was produced by Matsumoto Shigemaki and Sodesaki Wakaura I. 1st lunar month of 1721: Gizaemon's rank in the Kyôto hyôbanki, jitsuaku section, was jô-jô-(shiro)hankichi (superior - superior - (white) half excellent). 11th lunar month of 1722: Gizaemon performed in the kaomise drama "Ôbashira Kogane no Sazare Ishi", which was produced in Kyôto at Miyako Mandayû's theater by Segawa Kikunojô I. Fall 1723: Gizaemon went to Ôsaka. 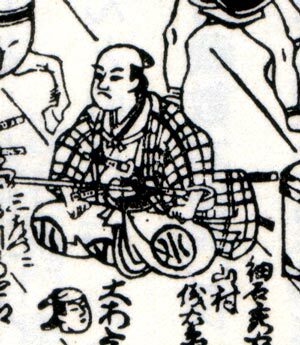 11th lunar month of 1723: he changed his first name back to Giemon, became tachiyaku and played at the Ônishi no Shibai the role of Yatôta in the kaomise drama "Fukujukai Kogane no Minato", which was produced by Sakakiyama Shirotarô I. 1st lunar month of 1724: Giemon's rank in the Ôsaka hyôbanki, tachiyaku section, was jô-jô (superior - superior). He shared the same rank with Wakaura Kinjûrô, Sadoshima Chôgorô I, Sakakiyama Shirotarô I and Arashi Sangorô I. 11th lunar month of 1724: he became katakiyaku and played at the Kado no Shibai the role of Wada Gonzô in the kaomise drama "Banzei no Minato", which was produced by Arashi San'emon III. 1st lunar month of 1725: Giemon's rank in the Ôsaka hyôbanki, katakiyaku section, was jô-jô (superior - superior). 11th lunar month of 1727: Giemon played at the Naka no Shibai the role of Sazareishi Hideemon in the kaomise drama "Imosegami Aioi no Futabayama". 1st lunar month of 1728: Giemon played in the same theater the roles of Ishihara Yasaji and Dobashi Gengoemon in the new year drama "Shôgi Gunpô Ryûko no Maki"; this was his last-recorded performance on a Kabuki stage; we don't know what happens to him afterwards. Yamamura Giemon I was active in Kamigata from the beginning of the 1710s to the end of the 1720s. He was able to perform a wide range of male roles, as a katakiyaku, a jitsuaku or a tachiyaku. He was said to be good in jitsugoto. He used two different ideograms for his two first names, Giemon [writing 1; writing 2] and Gizaemon [writing 1; writing 2].